As a therapist, I always ask new clients if they have a pet. It might seem like an odd question, but research studies have indicated that having a relationship with a pet can positively impact your physical and mental health. 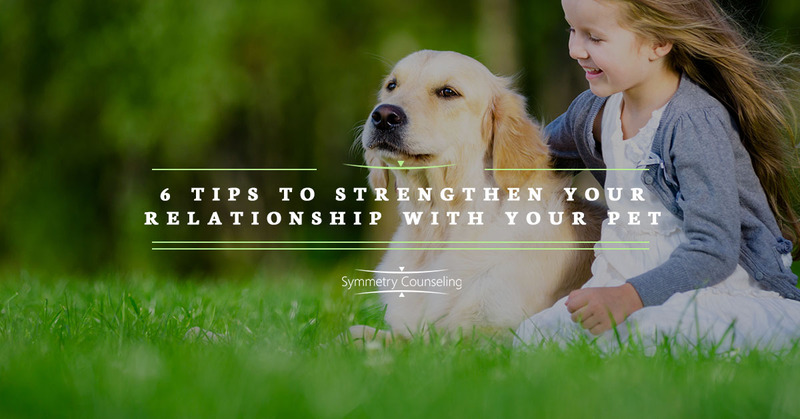 To make the most of that positive influence, it’s important to ensure that your bonds with your pet are strong. Provide your pet’s basic needs. These needs consist of food, water, shelter, safety, and medical care. This might sound obvious, as providing basic needs is expected of every responsible pet owner, but it’s also a way to establish attachment. For example, when you clean your rabbit’s cage, you’re investing in the relationship as well as creating an opportunity for your rabbit to attach to you. It’s difficult for anyone, human or animal, to focus on any relationship when their basic needs have not been met. Making sure your pet has everything it needs will help to build an attachment between you and your pet. Act as your pet’s parent. Being a pet parent isn’t easy. You have to say “no” and establish healthy boundaries in the best interests of your pet. Examples include training your pet, following a regular structure, and providing appropriate punishments and rewards. For example, requiring your dog to go for a walk even when it doesn’t wish to is an act of pet parenting. Parenting, especially when it’s difficult, creates a connection that strengthens your relationship with your pet. Learn how your pet expresses affection. Your pet has unique ways to express affection to you. These vary depending upon species, breed, and personality. For example, one bird might open its beak and pull its head back, mimicking a baby bird being fed, while another bird might simply bob its head up and down. Learn how your pet shows affection by reading articles, blogs, and books about how its species typically behaves around humans and then observing how your specific pet interacts with you. Learn how to express affection to your pet. Once you know how your pet expresses affection, you can then learn how to express affection to your pet. Again, consider reviewing literature to find out how similar animals prefer to receive attention. For example, some turtles love to have their shells scratched and be stroked under the neck. Then observe your own pet. What interactions does your pet appear to enjoy? These interactions don’t always need to be physical; your pet might enjoy the sound of your voice or simply your presence nearby. Respect your pet’s wishes. There are times when your pet’s desires might not match up with yours. It might feel ill, scared, or bored or just need some space. For example, some cats will purr when being petted one moment and then make it clear in the next moment that they do not wish to continue the interaction. Outside of meeting your pet’s basic needs or providing parenting interventions, consider the importance of respecting your pet’s wishes in order to build trust and strengthen the relationship. Integrate your pet into your life. The act of embracing your pet as an important part of your life can strengthen your bond. Try talking to others about your pet, joining a community of pet owners, and posting pictures of your pet on social media. Your pet is a part of your life—own it! Having and caring for a pet can have a positive impact on your physical and mental health, and it’s valuable to invest in this relationship. Do you need help to develop your relationships with the important creatures in your life, both animal and human? Symmetry Counseling provides individual therapy, couples therapy, and family therapy. Contact Symmetry Counseling at 312-578-9990 to schedule an appointment.